CD review: "Christmas Is 4 Ever"
This review first appeared in Turbula in December 2006. Apparently nobody ever bothered to tell Bootsy Collins that the age of funk is over, that hip hop and rap have replaced it. The longtime George Clinton sideman (Parliament and Funkadelic) and leader of Bootsy's Rubber Band has put out not only one of the funnest holiday albums you'll ever hear, but an incredibly seamless melding of funk and rap. Still dressed in his mothership garb (the sort of get-up so mercilessly mocked in "Undercover Brother"), still wearing his outrageous sunglasses and playing his interstellar "space bass," Collins has refused to change to meet the times. Even on songs like "N-Yo-City" and "Happy Holidaze" that feature rappers MC Danny Ray, Snoop Dogg and Djizzle, Collins and band don't really change what they're doing  they just very smoothly find the common middle ground between funk and rap. 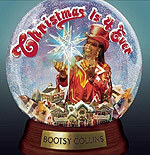 For that matter, though, Collins and his band turn the same trick with "The Christmas Song," finding shared space between Nat "King" Cole and vintage '70s funk. As they run through "WinterFunkyLand," "Santa Claus Is Coming to Town" and "Rudolph The Red-Nosed Reindeer," the wonder isn't that the band could turn these traditional holiday faves into deep funk, but that they can do so and yet keep the familiar holiday essence of these songs. The end result is an album that is non-traditional and a bit odd, and yet as comfortingly familiar as the Christmas albums recorded by Andy Williams or Dean Martin.